The Indian sub-continent or Bharatakhanda, from Himalayas to Cape Kanyakumari forming a holy ‘Inverted Triangle’, is a world by itself. This land, now known as South Asia in Western academic parlance, is not a ‘museum’ of cultures. It is in reality an abode of living communities of diverse cultures evolving to perfection, sharing the natural and physical resources without mutual conflicts from times immemorial. The rich diversity in ethnic cultures exhibits a very wide range, from mere anthropological to highly spiritual. Simple living, non-exploitative means of livelihood, well organized family life, unswerving filial commitments, spirit of sacrifice, quest for life beyond death and overall attitudes of self reliance and self respect are some of the basic characteristics common to all Indian communities – tribal, semi-tribal or marginal and civilised. The customs, traditions and beliefs of these communities are based on the faith that they all hail from One and the same origin which they might prefer to identify with one or the other cosmic or natural phenomenon. From the tribal communities’ unquestioning belief in the existence of Supreme Power to the highly speculative and philosophical thought of Brahman as reflected in the Vedanta, the Indian psyche could be understood as reflecting various dimensions of a common theme. This common psyche perhaps enabled various communities to live in peace and exchange their cultural traits for mutual benefit. This South Asia Region now politically divided into seven independent States (known as SARC countries) can boast of a unique status for its unbroken and ever expanding civilization backed by a very high Culture. The beginnings of this Cultured civilization can not however be traced historically. However, the secret of its continuity could be understood from its nature of peaceful assimilation of diverse cultural trends in its main stream without dissolving their cultural identities. Thus, a solid cultural mosaic has formed in this Region with the voluntary participation of all cultures-- classical, folk or tribal. The arts and crafts of ‘little’ or ‘great’ traditions have equally enriched the civilization and culture of this land. Studies in Indian folklore reveal cultural assimilation while preserving the sensitivities of various ‘little’ traditions. The sincere efforts of the ancient sages to reach out to the masses could be found in the development of folk arts for enlightenment through entertainment. While the Vedanta and Sastras were meant to serve the intellectual class, the Puranas were written for the benefit of common man. These Puranas are not lesser on any count than the Vedic literature. They are popular histories and each one of the major Purana is an encyclopedia by itself. Thus they are the storehouses of knowledge. They impart education, propagate Dharma and teach wisdom to all sections of people from a common platform. This effort has been continuously pursued by the ‘great’ tradition to help grow the ‘little’ while preserving their typical characteristics and art forms. The Puranas are followed by the Epics which constituted major content of the folk art performances. Buddhist and Jain traditions also attempted to reach the common man in the contemporary folk languages. Dharma has been the under-current of all these literary and art forms, both classical and folk. 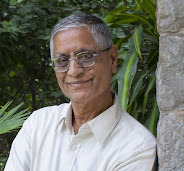 Satguru Dr Sivananda Murty (Bheemunipatnam, A.P.) while explaining the phenomenon in his simple and sweet but thought-provoking words, says that the Supreme Intelligence descends in myriad forms to help the ascent of man. This is symbolically presented as a “Triangle in an Inverted Triangle” in the Vedic lore. Thus the classical knowledge and folk art forms were integrated to facilitate the ‘Cultural Osmosis’. The diminishing number of tribes and tribal population in India from the remotest past to the present could mainly be ascribed to this natural process. As civilization became widespread, many hill-tribes and forest communities were naturally attracted to join the main stream. The development of modern vernaculars in medieval times has further hastened this process of assimilation. For, select folk art forms are employed to preserve the pride and culture of each community through their own historical narratives describing their origins to confirm that they were branched out of the same stem. The holistic and all inclusive character of the ‘great’ tradition was considered a major threat to the invading armies and alien cultures. Modern European colonists resorted to brutal annihilation of aboriginal tribes and native cultures in Americas and Australia. The English had applied persuasive methods of conversion of masses to Western culture and religion in South Asia. Two centuries of British rule developed many a crack in the Indian Cultural Mosaic. ‘Leave them alone’ policy of the Raj in respect of tribal communities stalled the process of assimilation and the gaps were, thus, widened. And the post independent era has further widened the cleavages. The rich diversity, which was once a uniting force, has turned out to be the weakness of Indian culture. The smaller units have turned out to be mutually antagonistic and collectively defiant to the uniting spirit of the age-old Culture. To assuage the wounds inflicted by the British Imperialists on Indian culture and civilization, the truth-seeking historians have to work with all seriousness to take up studies based on Indian folklore which may be considered ‘live’ historical data. I think the present work serves this purpose. I congratulate Dr P. Sadanandam for presenting his studious research work in a lucid style. May the Almighty bless him with long life in perfect health backed by all resources to continue his further academic research in this direction!